Named after its large head, the sperm whale is a huge, intelligent, formidable creature capable of diving to depths of over two kilometres. The sperm whale is the largest of the odontocetes or toothed whales. They are sexually dimorphic, which means males and females are visually distinguishable. Males can be almost three times as large weighing at about 45,000 kg compared to females which weigh on average 15,000 kg. Males reach around 12 m in length, which is the same as a double-decker bus. A sperm whale’s head is around a third of its body length, so for a large male, this is the same as a hatchback car. It’s no surprise then, that their scientific species name macrocephalus, means ‘big head’. 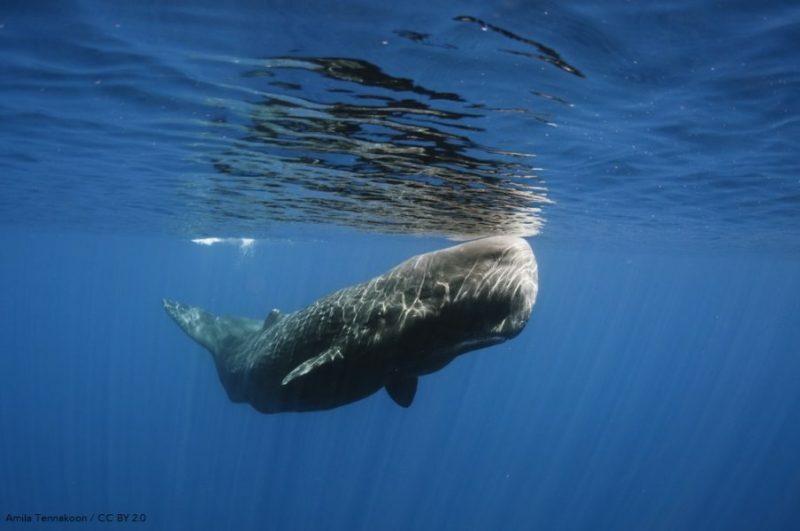 Inside their giant heads, sperm whales also have the largest brain on Earth. A large part of the head is taken up by oil-saturated fatty tissue called spermaceti, which generates powerful and focused clicking sounds used for echolocation and communication. It also helps adjusts the whale’s buoyancy. Scientists think the powerful clicks could be used to stun prey in a process called ‘biological big bang hypothesis‘. Below the spermaceti inside their heads is what is called the ’junk’, and is similar to the ’melon’ found in other toothed whales. This redistributes physical stress across the skull and is thought to have evolved to protect the head during ramming. 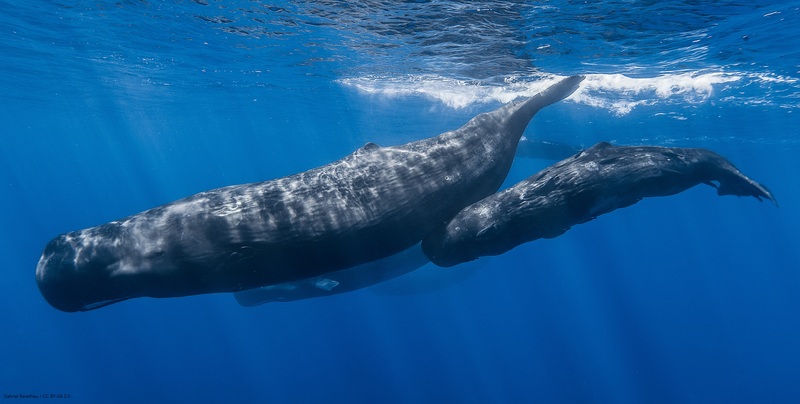 Although male sperm whales do not fight frequently for access to females, aggressive ramming behaviour is a common characteristic in the group of mammals from which whales are derived – the even-toed ungulates. Adult sperm whales can dive to more than 2.25 km and can hold their breath for more than two hours – only the Cuvier’s beaked whale dives deeper. They spend more than half of their lives at depths of 500m or more. Their main diet consists of squid, and they can eat squid that are up to 13 meters long. It is estimated that they eat 110-320 million tons of squid per year, with an individual eating up to 1.5 tons per day. This task is made simple by their huge teeth which, on their lower jaw, measure up to 27 cm high. Historical whale data also shows that sperm whales have been known to eat sharks, including basking and pelagic sharks! Where to see them: The best place to see sperm whales in Galapagos is in the channel between the islands of Isabela and Fernandina but whale watching in Galapagos generally requires a bit of luck. When to see them: All year round, but like all whale watching in Galapagos it is best in the cooler months of July to November. Threats: The greatest global threat to sperm whales, extensive commercial whaling, has ceased. They experienced a 67% population reduce between 1880 and the 1990s due to whaling. Although now globally protected, small scale whaling still exists and this can be a threat to sperm whales outside of the Galapagos Marine Reserve. There are also a number of other threats to the species including collision in shipping lanes and marine pollution. Conservation action: There are no specific conservation measures currently in place in the Islands, but sperm whales are protected by the Galapagos Marine Reserve. Globally, the species is on Appendix I of CITES and Appendices I and II of CMS. 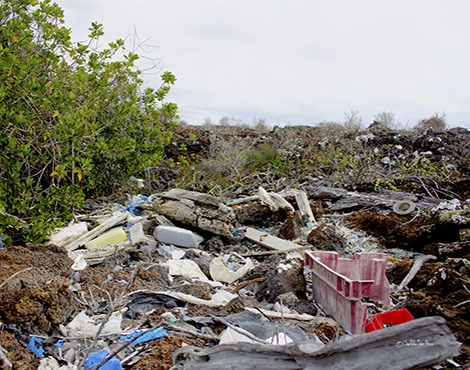 Currently, we are working with partners to reduce marine plastic pollution in the Galapagos Marine Reserve as part of our Plastic Pollution Free Galapagos programme.